The seasonal global land and ocean temperature for June–August 2017 was the third highest since global records began in 1880. The average temperature across the land surfaces was 2 degrees Fahrenheit above the 20th century average, the second highest June–August period in the 138-year record, slightly cooler than summer 2016. The ocean surface temperature tied with 2015 as the second warmest summer season on record. The United States had it’s fifteenth (15th) warmest and sixteenth (16th) wettest summer in 2017. Two very significant phenomena took place this past summer, first the “Great American Eclipse” which occurred on August 21st when the moon passed directly between the sun and Earth causing a total solar eclipse. 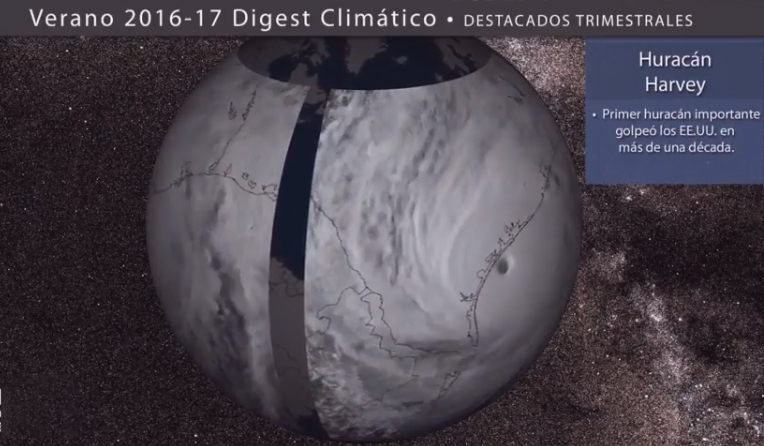 Satellites saw the moon’s shadow glide across the United States from Oregon to South Carolina! 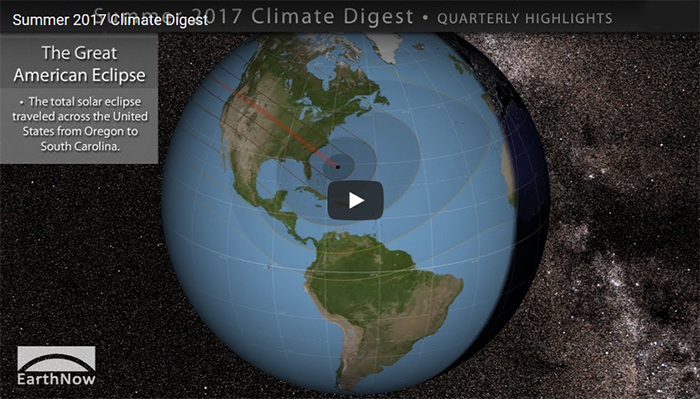 The quarterly climate digest, produced seasonally, consists of a short movie (3:24 minutes) made for SOS and an MP4 video accessible through YouTube. NEW! A Spanish language version is also available on YouTube! You can download the SOS content (both versions) from this FTP Site.